Sorry for the absence - I've had so much to do at work, I've not even had time to blog! Crazy! Here's a card I made a while ago and never remembered to share! So pretty, Lucy! The bird gets all the attention, love it! Great colors! Oh, my, so PRETTY! A sure sign of spring! Love it, Lucy! Your bird is beautiful! Lovely combination of image, color and pattern....such a wonderful classic style! Wow- your bird is just stunning!! Lovely, Lucy:o) Perfect mix of pp and the bird is marvelous. You have such lovely cards. Keep up the good work! So sophisticated! 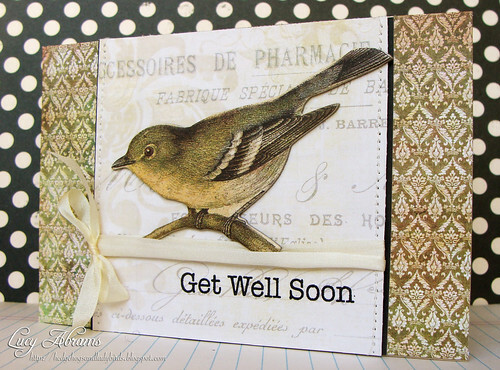 The bird is such a lovely focal point on the card! Lucy - this is beautiful. It´s so elegant and yet so upbeat because of the beautiful bird and sentiment! Absolutely stunning Lucy! I just love that bird and your beautiful patterned paper! so glad you remembered to share this card! it's gorgeous! WONDERFULL!!! I just can't take my eyes of it!